The new TonePrint iPhone app from TC Electronic almost has to be seen to be believed. It's fortunate, then, that we have a video all about it. Now here at TG, we're not exactly technophobic. We've reviewed (and liked) the Fret King Supermatic, which bedazzled us with its subtle self-tuning capabilities, we've championed the rise of Fractal Audio's Axe-FX II and we wet our tiny pants over the recent arrival of Garageband on the iPhone. 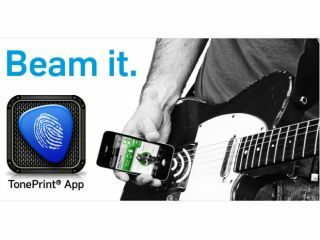 None of that, however, prepared us for the pure magic technical prowess of TC Electronic's new TonePrint app, which allows the transfer of TonePrint presets from the iPhone to your TonePrint pedals without the use of wi-fi, Bluetooth or wired connection. Instead it uses magnets to transfer a signal from your iPhone to the guitar's pickups, which is then sent along the cable to the pedal and loads the new TonePrint preset. All you need to practise this dark art is a TonePrint pedal, the latest firmware update and the TonePrint iPhone app (there's an Android version on the way), of which the latter two are free. This is not the first time TC Electronic has dazzled us with it's wizardry. Check out our video of the PolyTune in action, or head to www.tcelectronic.com for more information.